Gran Turismo – Industrial Chassis Inc.
We had a customer complain about one of our Studebaker clips not capable of an alignment recently. With all the shims removed from the adjusting plate, there was still negative camber. I had to investigate further, and on a chassis we are supplying right now we had the same issue come up. This is brand new for us, so I needed to investigate. This is what I came up with. The upper ball joint bore is moved outboard about 1/2″. This is causing a few problems, First off is the Camber issue. Second is going to be an issue of scrub radius. This may not cause any driveability issues, but you may notice a bit more wheel kickback on uneven road surfaces. 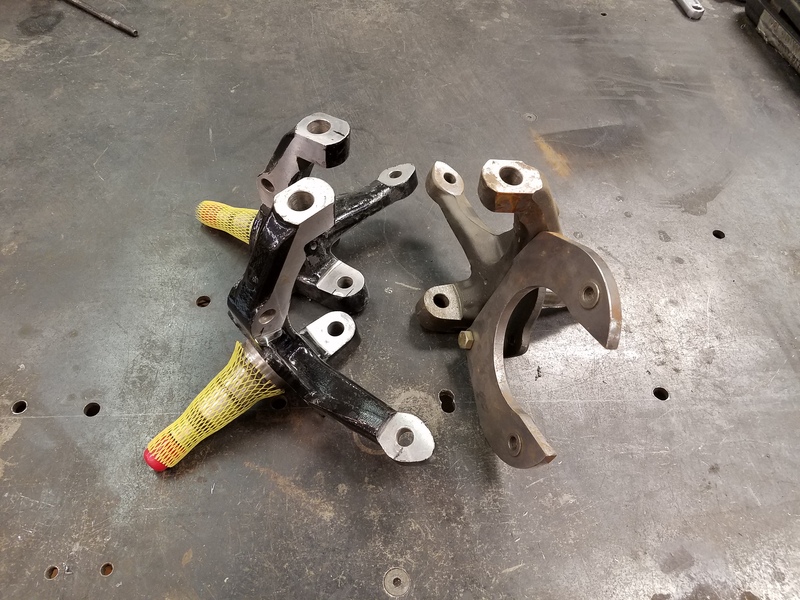 Short solution is to use a longer control arm, in some cases where the stock slot and T-bolt are used, you may not have much of an alignment issue. I spoke with a representative from Heidt’s this afternoon. Of course this issue has never come up with them. He informed me they use a 1/4″ longer control arm at 8″ from pivot to ball joint. No reason given as to why. I want to caution everyone that if you are to mix-match parts, you may end up with a front end that you can’t align. We have used the Heidt’s and CPP dropped spindles without this problem. I have used the stock height spindles from SPC and Kaiser without issue. Right side is different enough that a standard 3/4″ socket will fit around the ball joint nut. I want to go further with you as to what these changes will make to the way your front end will drive and handle in a future date. Right now I just needed to get this information out there. We have been working on a complete replacement frame for the Studebaker coupe. We had built a complete frame for a customer a few years back where we integrated one of our Studebaker clips and an early C4 Corvette rear suspension. We also learned what does and doesn’t work to make a frame that fits the stock body without modification. Well, very few and simple modifications anyway. Those tiny foot-well boxes behind the front seat have got to go. What we are delivering is a frame with significant improvements in strength. And almost all the stock body mounts are located in stock locations and stock body rubbers are used. No need to alter your front fenders, stock components fit. Straighter frame rails and more clearance for exhaust systems. We keep the entire frame profile slim for good ground clearance as well as give you room for future modifications. We made the rear kickup quite a bit different by utilizing more space under the stock floor. This gives us better places to attach the triangulated four bars and still not have to modify the floor. This rear kick up is also slightly narrower so that if you decide to do a mini-tub on the rear you have frame clearance to run up to a 275 wide rear tire on a 9″ wheel. Full Frame for 53-64 Studebaker coupes. Getting on with the full frame fabrication for Gary Spies 53 Studebaker C-Coupe. Brad came to us with this rusty Stude looking for a full frame build. He knew the original Studebaker frames were fairly flimsy to start with and his had been laying in the mud for a few decades. After sand blasting it was obvious it wouldn’t be up to his standards. We showed him his options and work on other Studes we had here at the time and made some decisions. Mustang II with custom tubular control arms, Bilstein shocks, power rack, complete new frame with tubular center section and a narrowed C4 Corvette rear. He dropped off the original frame for us to use as an armature and the tube stared flying. The rear axle assembly gathered most of our attention. To narrow one of these this much you lose the ability to shorten or otherwise use the stock spring. We converted the stock shock mounts to take Bilstein Coil overs and had to rebuild the steering rod assembly to clear the frame rails. I totally screwed up and didn’t get any shots of that work, I do have the 3D files of the center mount. First up was getting the body mounts, frame contour and suspension located. We used one of our existing frame clips for the front end and mocked up the rear suspension to see if we needed any special considerations before laying out the 2X4 box tube. Mid build it was decided that we needed a few more inches of space for the rear wheels, this threw a minor wrench in the works but it all worked out. Frame done we got the nod to fix the rusty parts and fit the body to the frame. This also gave us a chance to change the body mounts and add some really nice bellypans. Most of the rust was concentrated in the trunk area. Both front footwells needed to be replaced and the superfluous rear seat footwells were also eliminated. The stock firewall was lacking in style for a build this serious, same for the inner fender wells. Wes tuned up his hammers and knocked down some good stuff. I took on the custom hood hinges. In these shots you might be able to spy the firewall mounted brake power booster, inside is a custom pedal bracket with the option of adding a clutch. Wes got to do some extra detail work, the upper control arm openings got a nifty support and rubber boot. Staged for the door, Thanks Brad! Howdy folks! Been busy as all get out with Studebakers last week. We had a 1955 Commander post coupe in for a suspension upgrade and rare 1962 Studebaker Gran Turismo in for an engine swap that may turn out to be a fairly serious build. The 55 was really straightforward. We had previously build a clip for Mr. Desenberg’s 1960 Hawk and realized we had made a mistake in pushing the suspension too far up int the chassis causing problems installing the engine. A problem with the GT I will get to in a minute. I pulled up all my Alibre’ drawings and revised them to not only correct this issue but also refined the design and now we have a production capable clip. The installation took us about 14 hours in total from remove the front sheet metal, saw off the original suspension and install the new suspension. We included a set of our tubular control arms, Granada brake upgrade and power steering rack all for $4000.00. Mr. Metivier picked up his car just after we took in the rare Gran Turismo. Nice car on the outside. Someone had swapped the stock front sheetmetal for the older and cooler IMHO 53-54 sheetmetal. Brought in by our good customer, www.steeldreamz.com they were looking to swap out the really low mile small block Chevrolet engine and transmission for a more modern LS series and four speed automatic. As is our normal practice to do such a thing we removed the front sheet metal to get better access to the frame. This gives us more room to work and perform a more professional job. Doing this uncovered the previous owners work. They had installed a Fatman Fabrications front subframe. Due to design of this suspension clip, engine installation is nearly impossible without cutting the floor out and building a new trans tunnel and rebuilding the firewall. Sure it gets the car really low without dropped spindles but if it were designed with more forethought, similar results could have been achieved and made engine installation much easier. This shows just how much of the inner fender needed to be cut away just to clear the upper control arms. Rather than cut into the body further the installer decided to modify the suspension. Path of least resistance for him I am sure. However this created an entirely new problem, bumpsteer. Not only was the crossmember cut and dropped the rack and pinion was mounted lower off thick straps. Dangerous and crude, very nice combination. We are still waiting for input from the customer on this one. He want’s to replace his Mercedes Benz daily driver with this car. This is something we can do for him, just not with this mess of a front end. What is desired is a car that will drive very well, handle and brake and last as a new car would. What we would very much like to do is replace the Fatman clip with our kit. Our tubular control arms which are not only stronger but upgrade the ball joints and use OEM rubber control arm bushings for a much better ride without the polyurethane squeak and harshness. A set of Bilstein shocks and matched springs. A Flaming River variable assist rack and pinion would definitely set off the steering feel. And if there is any budget left, we would really like to rebuild the rear suspension with a torque arm system and Bilstein coil overs in the rear. I am going to try and make this blog a weekly thing, so, until then. Adios!